Am loving this book. Have read only the section on Elizabeth Simcoe so far, who I was prepared to label an entitled heiress [which of course she was] and dislike her for that reason. 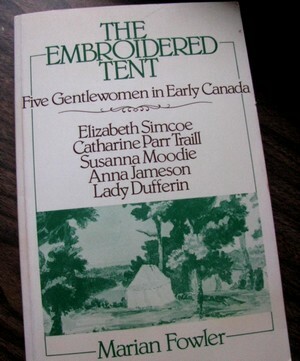 Turns out that despite her not so endearing trait of having zero compassion for underlings, or pretty much anyone of ‘lower class’, she was completely and utterly enchanted by the Canadian wilderness and heartbroken when her boring, whinging and militaristic husband John, decided to return to England. Her marriage was pretty loveless but for the [scads of] children [though children at that level of society were no trouble once ‘produced’ as they were farmed out to wet-nurses and nannies and had only a daily appointment with mother] and there’s a suggestion that she either had an affair, or thought about it a fair bit, with a much more upbeat and outdoorsy chap who lived on the shores of Lake Erie. Some of her paintings are in the British Museum, others, in the Province of Ontario Archives. Read this for origins on the word spinster. If you liked Susanna Moodie’s ‘Roughing it in the Bush’, you’ll love it. The variety of perspectives makes it especially interesting. I love this book so much — haven’t read it in so long that I should really pick it up again! And p.s. Merry Xmas to you!